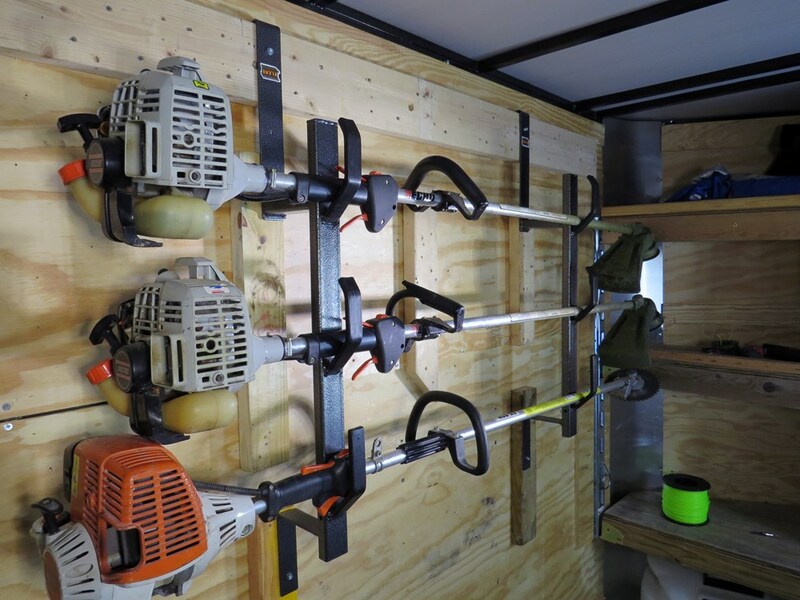 Trimmer Rack for Enclosed Cargo Trailers by Rack'em Manufacturing Lowest Prices for the best trailer cargo organizers from Rackem. Rack'em Trimmer Rack for Enclosed Cargo Trailers part number RA-5 can be ordered online at etrailer.com or call 800-298-8924 for expert service. Today on our enclosed trailer, we're going to install the Rack'em Enclosed Trailer Trimmer Cargo Control, part number RA-5. 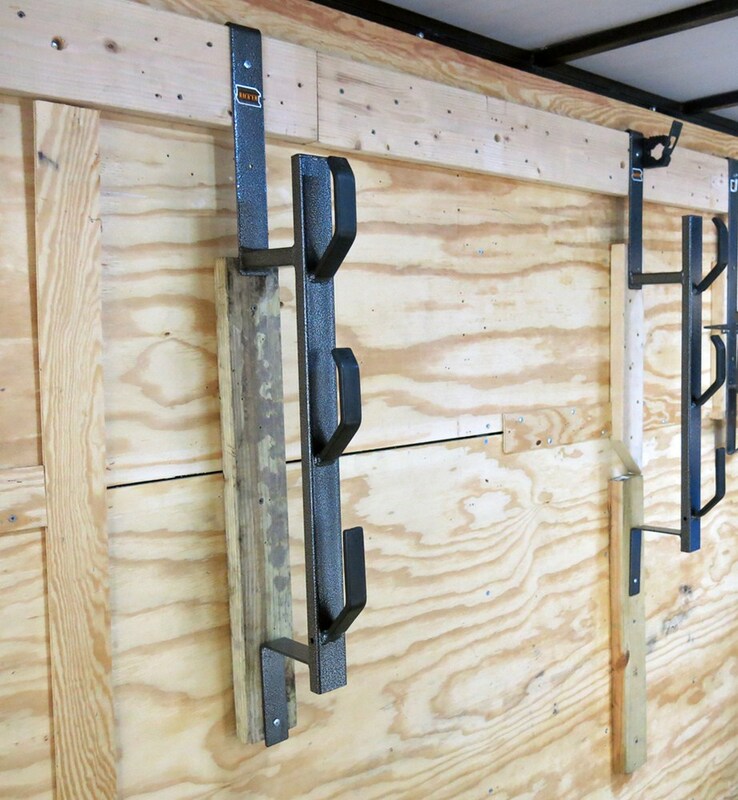 This is a trimmer rack for enclosed trailer. It has the design to hold up to three trimmers or two trimmers and a pruner or pull saw. It has a nice two-piece steel construction with a hammer powder coated paint finish to resist rust and corrosion and last for many years. Here with our rack installed, we can see it has padded hooks. This will help prevent marring and scratching of the equipment. The top two hooks have a slight bend in the top of the hook to help hold the trimmers in place and keep them from bouncing around or possibly off the rack. Here, the bottom hook comes off the rack and is flat so that it will accept larger equipment, such a pruner or a pull saw. Now we'll go ahead and load up our trimmers. 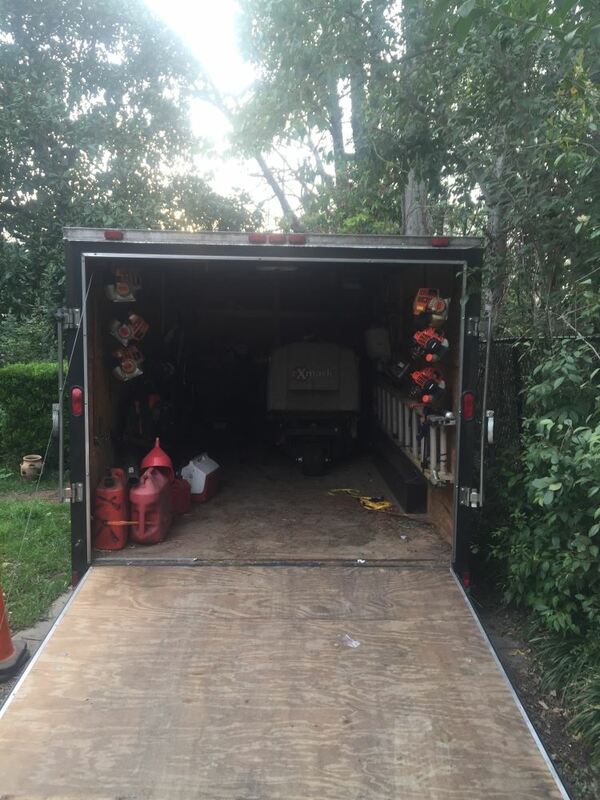 Once our trimmers are in place, you can see it's nice, neatly organized, and safely secures the trimmer in place so that we can run down the road without having to worry about our equipment bouncing around. Now let's go ahead and show you how to install the rack. The rack is a two solid piece design. We've got our top hook that goes down to the braces with a nice, welded assembly. We have a total of 5 inches here on the brace to offset it from the fall to allow for the trimmer width. Now at the top of the rack, we've got a prebent hook that will hook into the top of our enclosed trailer wall. However, since our trailer has been outfitted with some 2-by-6 construction that's been back pack on a 45, we're going to hang it from the 2-by-6. 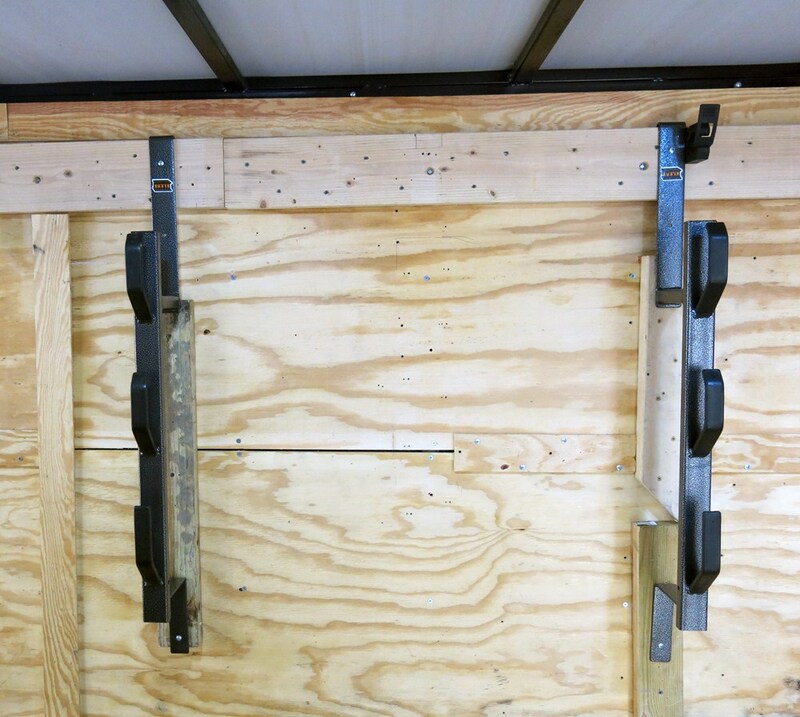 Going down the wall, we've installed a couple of 2-by-4s just to offset the width of the 2-by-6 construction. Then using the predrilled holes in our racks, we can use some self-tapping screws to secure the rack directly to the sidewall. 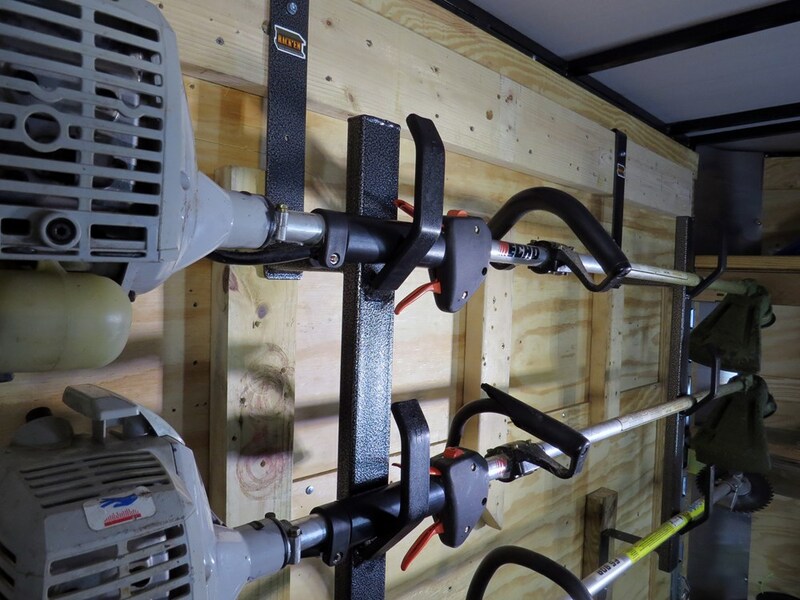 That will do it for the install and operation of the Rack'em Enclosed Trailer Cargo Control for Trimmers, part number RA-5. . 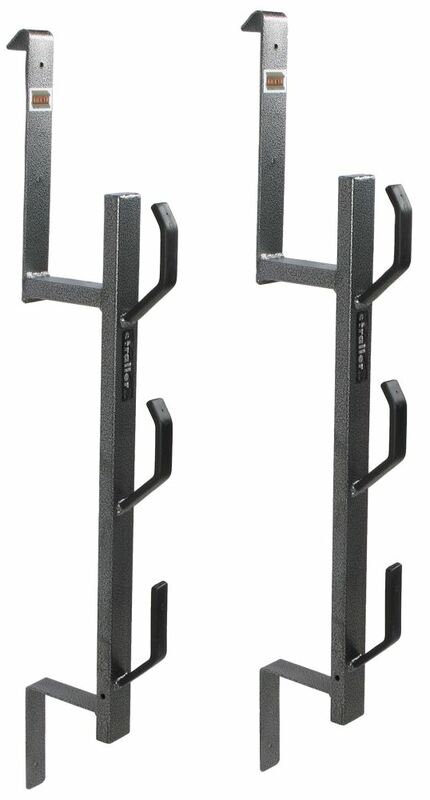 The RackEm Trimmer Rack for Enclosed Cargo Trailers # RA-5 has the top two hooks bent inward and the bottom hook not bent in. 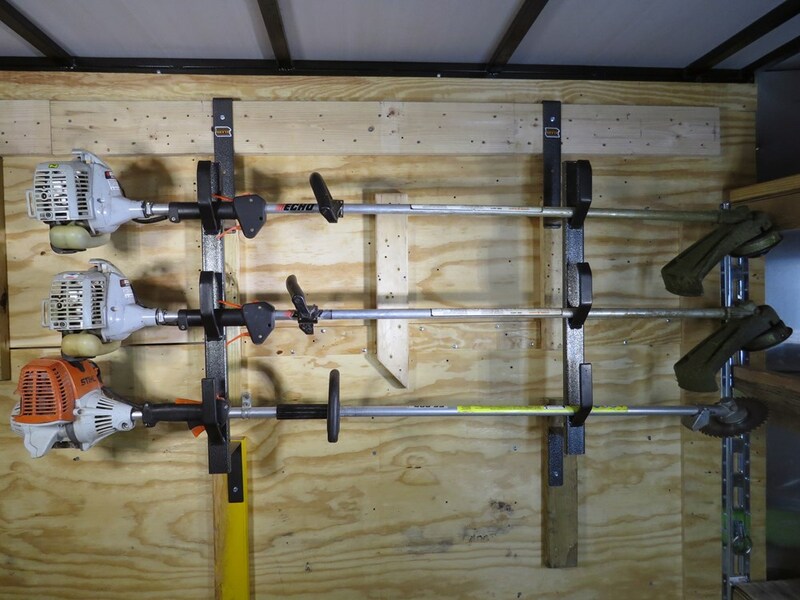 Our video states this is for larger items and references a pole saw or trimmer, but customers have used power pruners and trimmers in all three locations. The hardware would not have to go all the way into the frame when installing trimmer rack # RA-5. 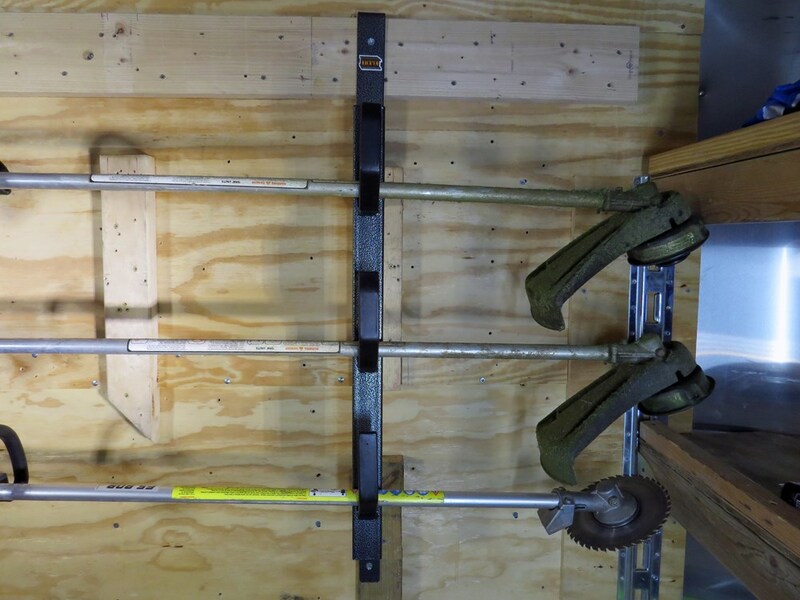 Since it is meant to hold 3 trimmers the weight of the rack and trimmers would not necessitate an installation through the 2x4s and into the frame. So you would only need some 3/8 wood screws that are slightly less long than the 2x4 is thick. A lumber industry standard 2x4 apparently is not exactly 2 inches by 4 inches but 1-1/2 by 3-1/2 (or close to it). So 1 inch long screws would work. Had the hard to find part I was looking for & shipped it that day. Great service!